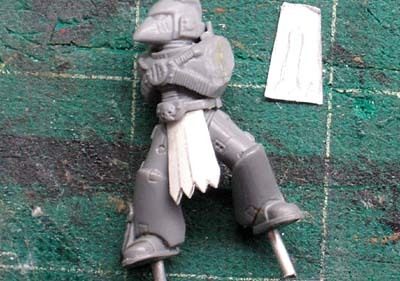 This little trick (idea more appropriately) came to me the other day while I was working on the test model for the Flesh Tearers sqaud I'm doing. It's not the squad that gave me the idea, but painting his hair that did it. Here it is in a nutshell... you don't have to sculpt every little detail. Yep, I said it right, you do NOT have to sculpt every little detail. You can simply paint it on. We do it all the time with battle damage. 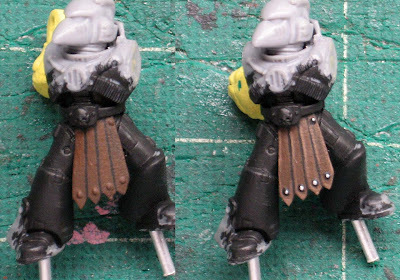 We all don't go out there and cut away at our models or drill holes in them or actually chip the paint off the edges. We just paint it that way. Because the "effect" is shallow. This means the effect we are going for is very thin in real life. Rust or chipped paint does not have any depth at this scale so it can be replicated easily with paint. That means this isn't going to work on things that have any substantial size (thickness). You're not going to be "painting" bullet casings on the ground. It just won't look right as they are too big for the illusion to work. With the model above, his hair is only sculpted along the edge where it meets his face. I decided to add a few brush strokes along the top to give his hair some definition and add some variety and texture to an otherwise dull area. The effect is convincing enough and you look at it thinking his hair parts down the middle like it does. Here's another example... taken to the extreme. Lets say you want a squad of guys all with the leather strap tabards. They look cool and it would really make your unit stand apart from the rest of the force. You have a few options. 1. You could buy enough bits and they'll all have the exact same piece. 2. You could get someone or you could sculpt them all yourself. 3. You could make them with cardstock and paint them. I've taken some regular index card and cut it into the shape of a leather strap tabard and glued it in place on this Space Marine here. The key thing here is getting the right shape to the object overall. The pointed ends of each tabard help define the shape of the object. The painting will seal the deal. With paint and some "glue drop" rivets, we have a fairly convincing tabard that just about anyone can do in a few minutes. The painting adds the final bit we need to make the piece look convincing. Like the hair in the first example... the shape is there, we just need to fill in the area and create the texture. We use our highlights and shadows to create the illusion that one leather strap hangs in front of the other one. The rivets being actual texture add that final touch. 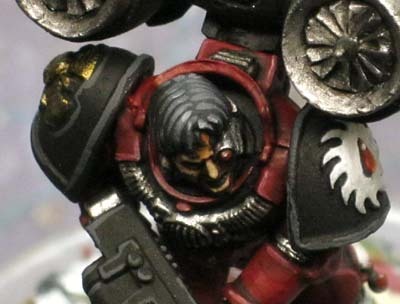 So next time you need that little bit of detail on a model, think about painting it on. It won't work for everything, but there are some cases where it can make an otherwise normal model look great. A Painting Quiz, how much do you need to paint? Great effect, and one that I know I've overlooked in the past. Very cool. Just enough texture to sell the effect. This is one of those things that I always go back to thinking about John Blanche's miniature work for. The use of 2D effects on a 3D surface. Video games do this ALL THE TIME and it works wonders for them! Great way to spotlight something I don't think enough people use to add interesting and useful detail to their models. Very Impressive. I'll keep this in the back of my mind as I'm still working on the whole shading thing. Mike: Thanks for sharing the link. Interesting post there. I think the lines are blurring between the two mediums with plastic/resin starting to pull ahead in terms of overall quality myself.